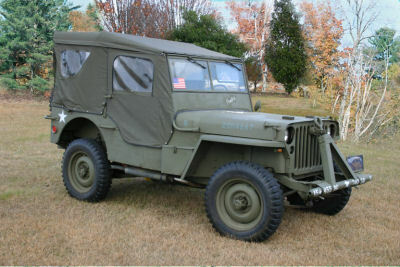 My Jeep After The Last Refurb People talk about Hummers and such but I say who cares. There’s nothing better than a jeep. 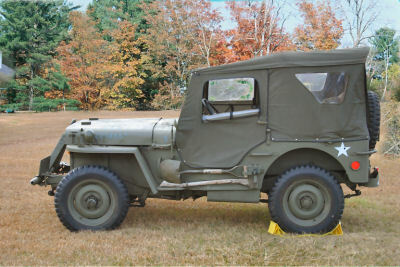 A Ford GPW jeep is even better. 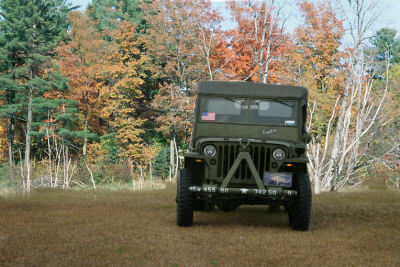 All the while, while I was shooting these pictures the jeep’s engine was purring. What a great vehicle to have. Driver’s side rear quarter view. Rear view. 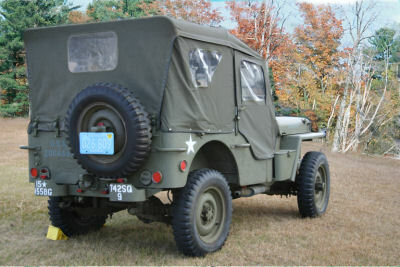 Passenger side rear quarter view. 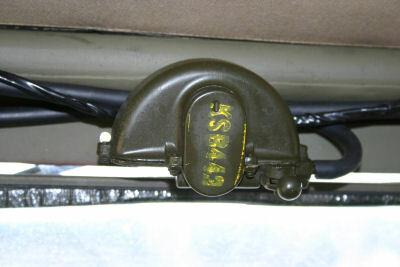 Passenger side view. Passenger side front quarter view. 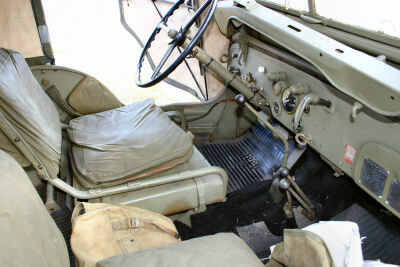 interior shot of dash. 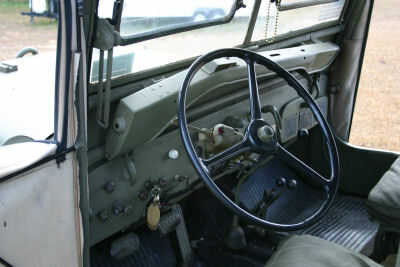 Interior shot looking to the rear drivers’ side. That’s just an old military surplus box I found somewhere and mounted a radio. I need to do some more work in that area. Looking to install a CD player so I can have some period toons to play.Passenger side view of the dash. That red sticker is for the WARN overdrive that I installed on this jeep. 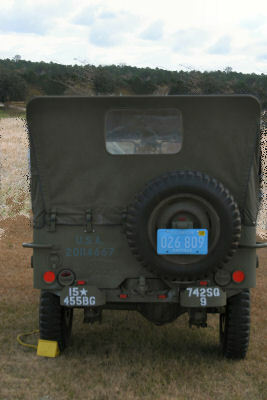 The jeep drives very nicely at 50-55mph. Unfortunately, the data plates are not original and are not even good reproductions. I have some very nice repros from Europe that I purchased from Richard Grace. Eventually I will find them in my garage and install them. 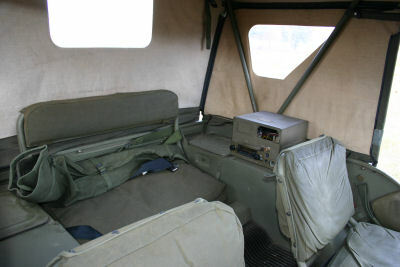 Interior shot of rear passenger side. Engine bay fom the passenger side. 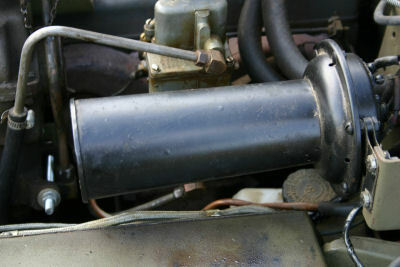 I installed a NOS dust-proof distributor that I purchased from Joel in Maine. A gruff but nice guy. Engine bay from the drivers’ side showing my installed T-1 Air Compressor. It’s a clever device. 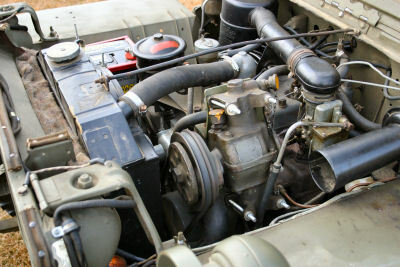 Turn the ignition off, engage the compressor, and use the compressor. When you are done, just kick the revs up and the air compressor will disengage itself. 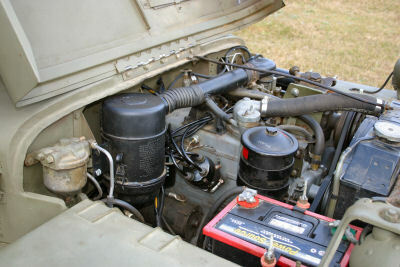 Strickly speaking a May 1942 jeep wouldn’t have had a lube chart and bracket under the hood. But I’m going with the Motor Pool angle here as listed in TB ORD 117 (Custom made holders for Lube Orders and where to stow them.) Unfortunately, that’s all I have, anyone have the actual TB? Another engine bay shot. 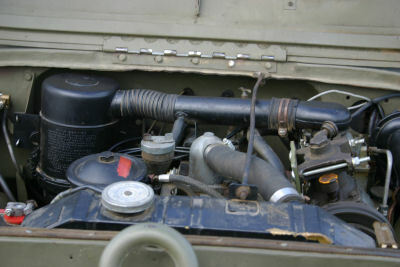 Showing the NOS (well it was TWENTY YEARS AGO), Oil Bath, Air Filter that I purchased still sealed in the box from Surplus City Jeep Parts. 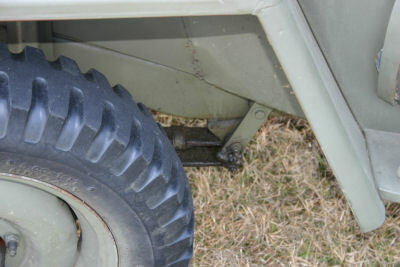 This is a shot of my WW2 tandem hitch. 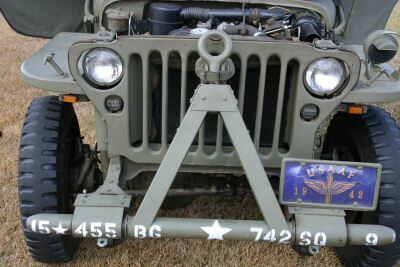 The postwar hitch left the original bumper in place and then mounted the hitch with some plates in front. I have had this hitch for about 20 years. Never used it. I feel it is too short a draw to use behind my vehicle. 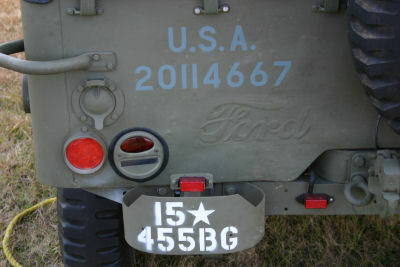 Close up view of the rear of my jeep, showing the registration number and Ford script. 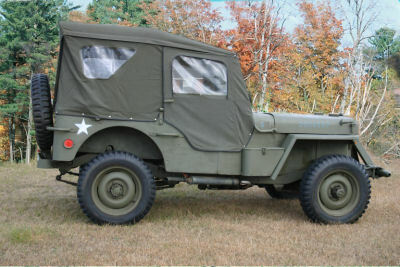 Unfortunately, the stencils I purchased from a nationally advertized outfit did not have the correct font for my WW2 jeep. So yes, I know it’s wrong. 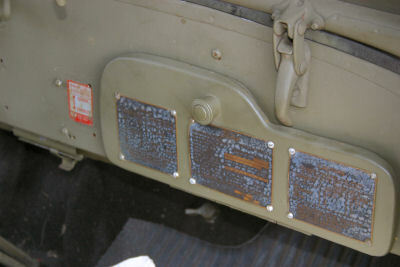 It took me nearly 20 years to find the Ford script and get it installed into the rear panel of my repro bodied jeep. It was a great day when I got it installed. The 455th Bomb Group was the parent organization of the 742BS (see next page). 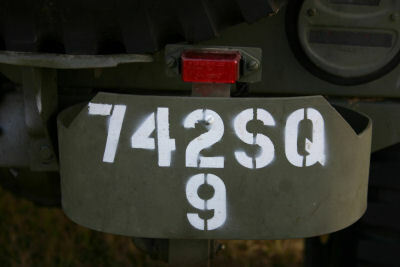 Close up view of my unit markings. This stands for the 742nd Bomb Squadron, 9th vehicle. I was stationed in Minot, ND in the 1980s, assigned to the 742nd Strategic Missile Squadron. 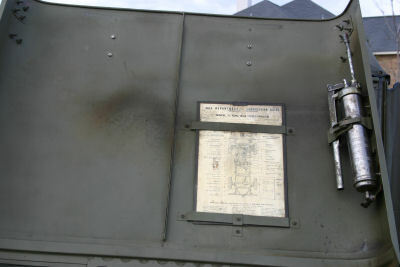 The history of that unit was developed in WW2 as the 742nd BS. 742 Bomb Squadron patch from WW2. 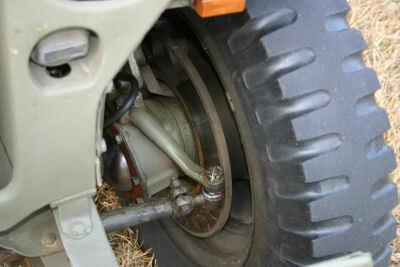 Drivers’ side wheel well. 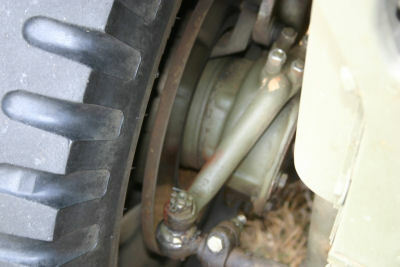 Yes, my jeep has disk brakes. It was a long battle to get them installed. They work so much better than my stock set up. Another view of the disk brakes, you can see the spacers I had to have machined to get the brakes to work. Close up view of my ‘Sparton’ horn repro. It’s a 12 volt horn that I have had for about 20 years. 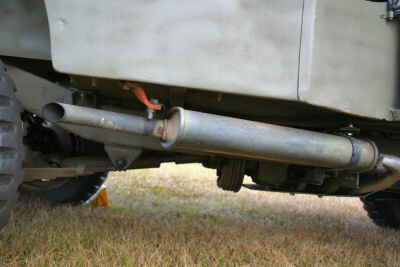 Passenger side view of muffler. 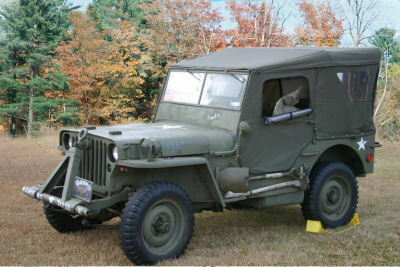 I’m pretty sure my jeep should be sporting a round muffler instead of oval…but alas, the Motor Pool beckons. 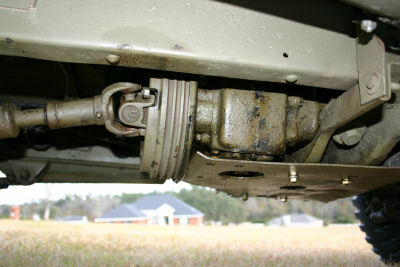 My jeeps’ transfer case and parking brake. It is a PARKING BRAKE not an emergency brake. Unfortunately, I have the late war version instead of the correct band version. 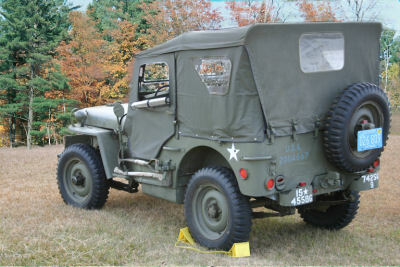 Yes, my jeep has disk brakes on ALL four corners and boy does she stop. The springs are not GPW but were purchased from JC Whitney in 1983. I’ve learned a LOT since then…like keep the ORIGINAL body at all costs. Oh, well, water under the bridge. 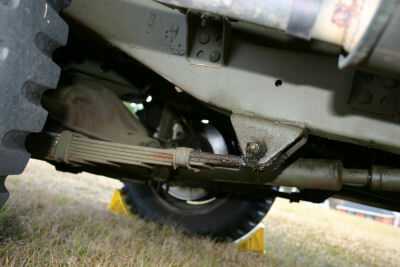 Vaccum wipers on my jeep. These are neater than the JC Whitney electrical versions I use to have. But alas, they are just junk and not really for the jeep. But they work after a fashion…intermittently during the rain. Let off the gas and they wipe, give the gas and they pause. Well, that’s some pictures of my jeep. You may have noticed the top? It’s an Olive Drab vinyl top made in the 1980s by BestTop (I believe) and it has been super. I rate it superior to the canvas version. No shrinkage. Of course, it’s not correct for a show jeep…but then I NEVER wanted a show jeep, I wanted a jeep to play with and that I have for lo’ these 25 years!